The Met Office will be behind the scenes of the new BBC magazine show ‘The Great British Weather’ which starts tonight on BBC One at 7.30pm. The Great British Weather is an interactive live series set to tap in to the nation’s obsession with weather, as we find out which clouds mean we should dig out our brollies and where to head for the most sunshine in Britain. It also helps to answer our annoying weather questions, does it really rain cats and dogs – or does it actually rain frogs? Does red sky at night really mean shepherd’s delight? Why are there so many types of clouds and why are they so different? We have been providing expert scientific and meteorological advice, support and guidance into the making of the show and we’ll have an expert on hand at the Great British Weather HQ to help answer questions during the show tonight. Through the series there will be a number of features on the work of the Met Office and how we have been forecasting for the nation over the last 150 years or so. This includes providing forecasts for the British armed forces in times on conflict from the D-Day landings through to Afghanistan, services to keep the nation moving and switched on as well as keeping the nation safe and well. 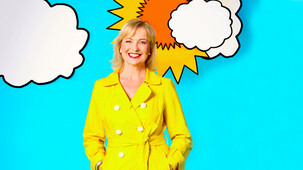 The Met Office’ s own Carol Kirkwood will report on the weather, not from the safety of a BBC Studio – but from 15,000 feet in the air as she paraglides into the heart of an enormous Cumulus cloud. How vast is it? How much does it weigh? What does it taste like? Carol gets her head in the clouds to find out. This entry was posted in Met Office Diary, Met Office News. Bookmark the permalink.